Escape from Berlin is actually an omnibus of three novels, Good-Bye Marianne, Remember Meand Finding Sophie that are being re-released on the 75th Anniversary of the first Kindertransport. On December 1, 1938, the first manifests of orphaned Jewish children were sent to England to escape the increasing persecution of Judaism as a whole in Germany. Sent to England without friends or family, they were brought into alien households under varying auspices and forced to quickly adapt. In Good-Bye Marianne, seven-year old Marianne, daughter of an Aryan mother and a Jewish father, learns quickly the lessons of fear and suspicion as her family is subjected to increasing hostility and the denial of their civil rights. As the first Kinderstransport is scheduled to depart, a spot opens up on the list and Marianne’s mother sends her on in the sick orphan’s stead. In Remember Me, Marianne struggles to assimilate herself into the English landscape. Anti-Semitism in England is no less ugly for not having seem systemized as per Nazi Germany and; added to the strangeness of a foreign land, Marianne is homesick and hungers for friendship. In Finding Sophie, the perspective changes to that of Sophie, a little girl who Marianne had briefly befriended while they were en route to England aboard the first Kindertransport. Years have past since then and both children are now young adults who have settled into life in England, though with mixed feelings about their native country and the friends & family that were left behind. In this novel, Sophie manages to connect with Marianne, a tenuous friendship made more lasting by the strength of shared experience. At best, the Kindertransports are often only a footnote in WWII history and Escape from Berlinoffers a bit of authentic insight into the experience. Though it is historical fiction, autobiographical details certainly factor in as the author herself was aboard the first Kindertransport as a seven-year old. Alas, the writing is also somewhat facile in plotting and vocabulary, even granted that this is marketed as juvenile fiction. There is certain lack of richness to the writing despite the emotional tax it has the potential to levy; but it it is a good start for children ages 7-10 on a subject that unfortunately is being relegated as trivia or worse, mythos. OTHER: I received a trade paperback (finished copy) of Escape from Berlin (by Irene N. Watts) through the LibraryThing Early Reviewer. I receive no monies, goods or services in exchange for reviewing the product and/or mentioning any of the persons or companies that are or may be implied in this post. 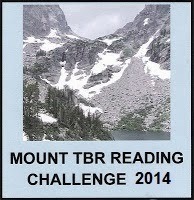 Bev Hankins hosts this challenge at her blog, My Reader’s Block. I am committing to the Mount Arafat (minimum 48 books) level. All books will have been culled from my stacks and will have been acquired prior to January 1, 2014. Some books will be selected for having been on my list the longest, others through a random number generator (random.org) cross indexed with my exported goodreads list; and others as a matter of serendipity. 50 books, 50 quick & dirty reviews, one year.